Fitness Bracelets and Activity Trackers - How Wearables Work? Wearable gadgets have flown into our everyday life in the recent months and, despite many expert predictions that 2014 will not become the year of wearables, it's clear as day that wearable technology is here to stay forever. Smart fitness bracelets, smart watches and smart glasses are going mainstream gradually yet confidently, and will inevitably become commodity products soon just like smartphones and tablets. But few of us really know how wearables gather required information about us, what exactly they measure and how they do it. So, I've decided to write this post for those curious about how wearable gadgets work. Are you looking to build an app for a wearable gadget? SIGN UP FOR FREE CONSULTATION WITH INTERSOG NOW! Almost all of today's fitness bracelets available in the market are based on a three-component accelerometer that enables measuring acceleration against the three axes, i.e. start and end of the motion, and its intensity. A regular accelerometer used in Jawbone UP! consists of two electrically charged plates and a small counterbalance in-between. When the sensor is still, the counterbalance is located right in the middle. However, once you start moving, the counterbalance moves from one plate to another and the sensor registers the motion. Yet, gathering data about the motion is only one task of many to be completed by a tracker gadget. The device should process this data so that we, users, are able to view it properly on the screen. Different gadgets use different algorithms to calculate the gathered data in the most precise and useful way. 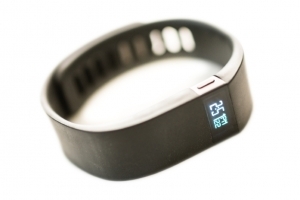 Some gadgets simply count steps, while others such as Nike FuelBand convert all data into their own units (e.g. fuel) and count calories and other factors. These algorithms are, as a rule, kept a closely guarded secret and are changed every now and then. To ensure accuracy of the gathered data, wearables makers such as FitBit test the data against the same data received by other devices. For instance, precision of calorie estimations is tested against precision of calorie estimations made by a portable telemetric oxygen uptake analyzer. The ways wearables are synced with a smartphone are different, too. For instance, Shine and FitBit sync via BlueTooth which appears to be the most popular method so far. However, in order to save battery life, Jawbone UP! syncs with an iPhone via an embedded mini jack and earphones slot. Unfortunately, precision of data displayed by wearables leaves much to be desired. It becomes obvious if we compare data shown by different devices for the same activity, or if we compare some smart trackers with regular pedometers. Smart fitness bracelets are not precise enough because they're affected by unintentional movements, excessive gestures or keeping an arm in the pocket. For your information, 0,25 miles are 540 steps for a regular pedometer and Jawbone UP!, 538 steps for FitBit One and 552 steps for Nike Fuelband. Tech bloggers and journalists have recently conducted a lot of experiments in order to detect and explain gaps and mismatch in data analysis by various gadgets. Shyam Patel had been testing Fitbit One, Jawbone UP!, Nike FuelBand, and the BodyMedia LINK in the gym and real life for 28 days and had published a comparative review of data accuracy in his blog. One of his conclusions is that Fitbit usually "flatters" its users and somewhat exceeds the results, while, on the contrary, Nike FuelBand underestimates the results: 191,000 vs 116,000 steps. On average, deviation in results makes no more than 20% across all wearable bracelets compared. As such, app developers will be challenged to design and deliver higher precision applications for wearable activity trackers and monitors during 2014, as data accuracy will probably be one of the key factors impacting user purchasing decisions this year (followed by usability, of course). And that's where new developments in Big Data science will come just in time! Continue reading about how smart watches and smart glasses work.